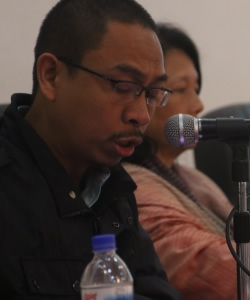 Faqihuddin Abdul Kodir is founder of the Fahmina Institute, an Indonesian NGO working on gender, democracy, and pluralism from an Islamic perspective. He works also in the faculty of Islamic Law at Syekh Nurjati State Institute for Islamic Studies (IAIN), Cirebon, and the Fahmina Institute for Islamic Studies (ISIF), Cirebon as a lecturer on hadith and legal injunction. He works with Muslim NGOs across Southeast Asia to formulate how gender justice can be culturally negotiated and adopted within Islamic perspectives. Kodir’s work concerns the topic of conversational hermeneutics and how they create the opportunity to revisit religious texts for contemporary readers who are struggling for universal justice regardless of gender, race, and religion. He is an advocate for progressive Islam in Indonesia, especially concerning gender justice and democracy.